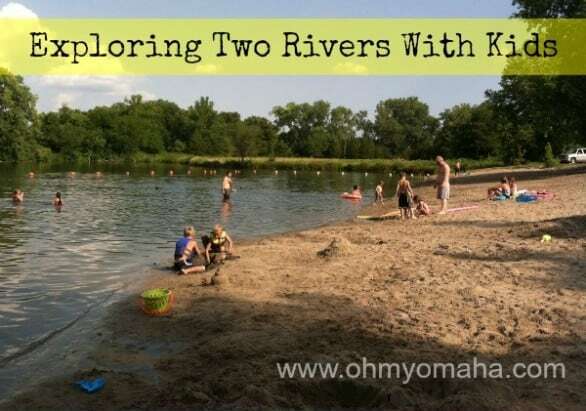 If you’ve lived in the Omaha are for a few years, most likely you’ve heard of Two Rivers State Recreation Area, AKA Two Rivers. 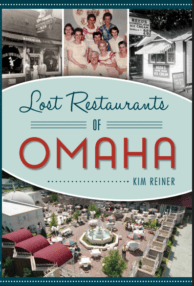 Having spent my childhood just a few miles from there, it’s surprising I had never been there. I hated fishing. My family didn’t do the “tent” thing. Flash-forward to 2014 and here I am with a family interested in doing both. This place is for families…who love to fish. In addition to the nearby river, you’ll find several sand-pit lakes stocked with trout (lake 5), bass and the like. Fish species available in lakes Nos. 1, 2, 6 and 7 include largemouth bass, crappie, bluegill, bullhead, catfish, and carp. Lake Nos. 3 and 4 are catch and release lakes, and barbless hooks are required. All lakes are open year round except for Lake No. 5. If you love to fish, you’ve come to the right place. 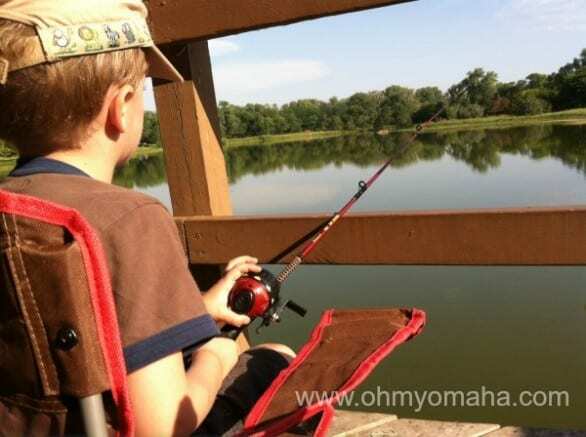 We brought the kids’ fishing gear to try out the catch-and-release trout lake one morning in August. No luck. One friendly fisherman tipped us off that the parks department restocks the lake in the spring and that April would be prime time to fish there. 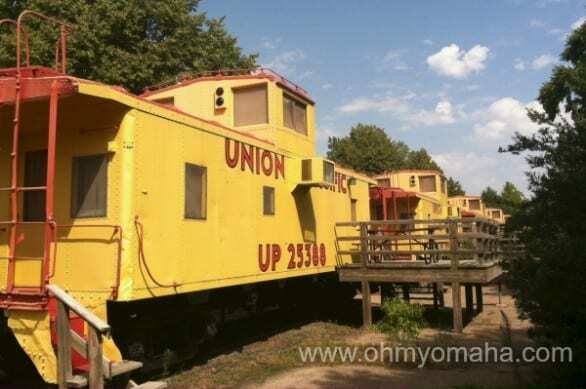 The park is also known for its repurposed cabooses, which sleeps up to six people. They have two bunk beds and two mattresses in the cupola. They have bathroom facilities (with a shower), and a kitchen with a stove, refrigerator and sink. Outdoors, you’ll find a grill and firepit at each of them. They’re only open Memorial Day through Labor Day, though. You can stay overnight in one of the cabooses at Two Rivers SRA. You can bet it’s a hit with children. You can bet my kids were enamored with these cabooses. I foresee an overnight in one of these babies in my future. There are several campgrounds suited for tents and campers. We did the tent thing (our first overnight with the kids – an adventure in itself). Our camp area was crowded, a combination due to the end of summer nearing and fantastic weather. It’s definitely an RV kind of place. Pack a swimsuit and sand toys for the children. One of the kids’ favorite parts of the park was the small beach not too far from our campsite in the Goldenrod section. Lake No. 4 is a lake you can swim in, though there is no lifeguard on duty. If you’re curious, it’s Lake No. 4 and there are no lifeguards. 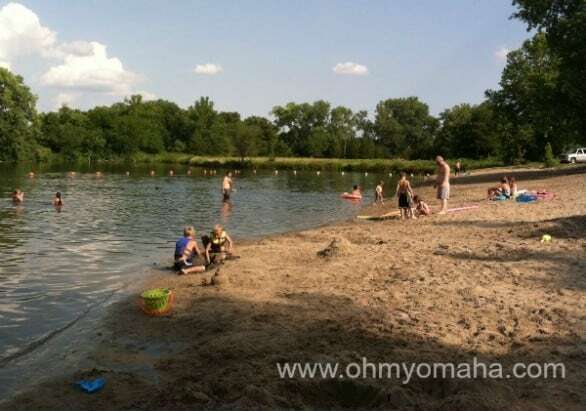 It wasn’t too deep, and everything you’d expect from a Nebraska lake. Bring your bikes. It’s a flat area and drivers seem to be pretty careful out there. We saw many new bicyclists testing out their bikes and training wheels out there. Made us regret leaving ours at home. I found out, after the fact, you can rent bikes there. There is a convenience store located at the park’s entrance that serves up a decent breakfast if, for example, you packed a pitiful breakfast and everyone’s still hungry. The park’s convenience store has most everything you need for camping, including what I’d consider essential, soft serve ice cream. And thank the restaurant gods, they have a “while you’re waiting” stash of games there. We made use of that. The convenience store is also where you can get all the other camping supplies you forgot, toys for the beach, and ice cream. All important stuff. They also have a cold water cooler there, which is nice to refill your water bottle if you’re out for a walk. We’re a hiking kind of family, so this park was not a good fit for us because there were no great trails. There aren’t hiking trails like you find at bigger parks. This one was nice but really short and not at all removed from the rest of the world (ie. the campsites). The closest we got to a hike was a short walk around the trout lake. The playgrounds were incredibly dated. My kids didn’t so much complain as just willingly leave when I suggested we head back to our campsite to start dinner. My kids never willingly leave a playground. 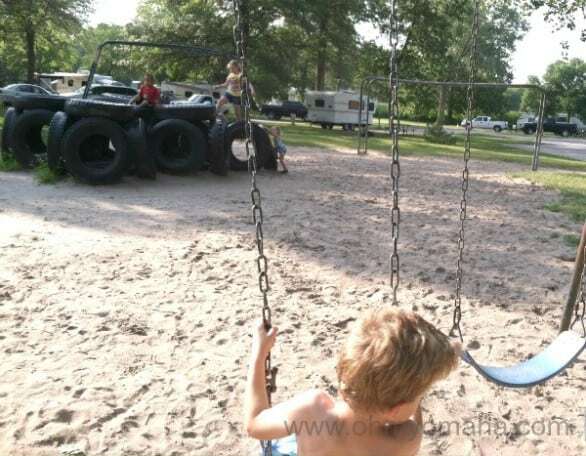 The playground near our campsite. 27702 F St., Waterloo, Neb. 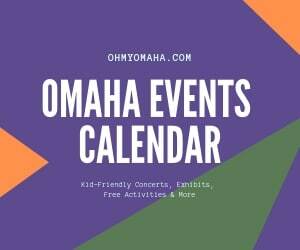 From Omaha, take Q Street (west) all the way out or Center Street to 264th Street and turn south at the flashing light. 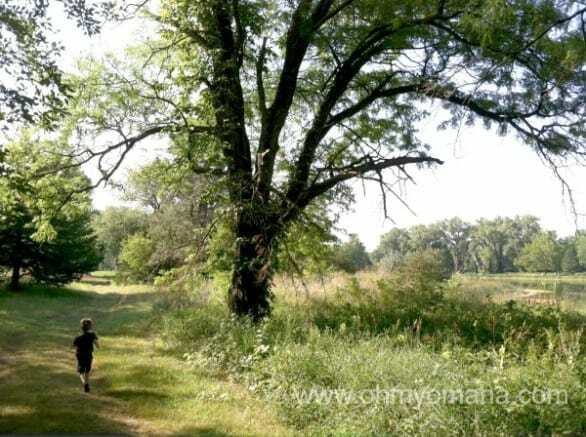 There’s a lot of beauty at this park, and if you’re a fishing kind of family, you’ll enjoy this park. Have you been to Two Rivers? What’s your favorite part of the park?